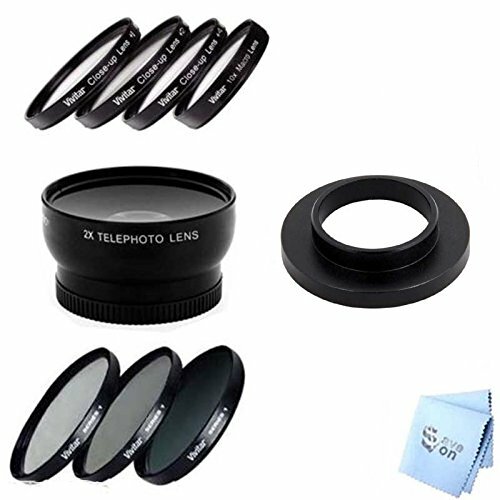 2x Telephoto Lens Attachment for 37mm Filter Thread Telephoto Professional Series Lens - When your digital camera can't get you quite close enough to the action, this 2x telephoto accessory lens will bring the action twice as close to you. It's perfect for all your long-distance photos of sporting events; candid portrait shots, as well as nature and wildlife photography. This is the ideal lens attachment for sports fans and parents whose kids play sports. 3 Piece Filter Kit: Clear Filter (UV) - A UV Filter protects your camera's lens from scratches, dust, dirt, moisture and fingerprints, while reducing unwanted ultra-violet light. Leave it on your lens at all times. 4-Piece Close-Up Macro Lens Set: Included are +1, +2, +4 and +10 Close - Up Lenses. High-Quality lenses are diopters for close up photography. They shorten the close focusing distance of the lens, this allows the lens to go closer to the subject and achieves a larger image scale. Lenses may be used individually or in combination for a greater effect. 100% Warranty Covered by SAVEoN! If you have any questions about this product by Promax, contact us by completing and submitting the form below. If you are looking for a specif part number, please include it with your message.